It's great to know where your friends are at all times, though sometimes it is kind of fun to hang out with people other than T.I. 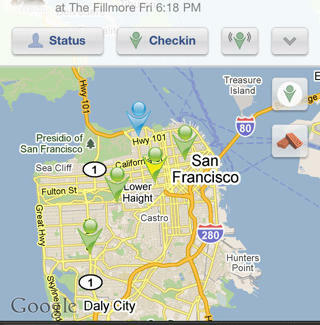 For a new way to keep track of all your besties regardless of their electronic ankle bracelet situation, check out MeMap. From a world-traveling, Marina-living Aussie programmer who has always had trouble keeping track of his mates (that's Aussie for friends! ), MeMap is a just-launched iPhone app that automatically plots the locations of all your Facebookies using their shared check-ins from all sorts of location-based sites like foursquare or Gowalla, but not Koala as that site's a bear. The app rocks a Google Map-esque interface with colored pins for every chum that -- when clicked -- will tell you where they checked in and at what time, plus there's also a Facebook-esque news feed that sorts all of the check-ins by date/time and tells you exactly how many miles away the check-in was from you, unless you're Camilla Belle, in which case you already know the check-in is coming from inside the house. Other features include a Ping function (similar to a mass text, sorts all your friends by their proximity to you and then lets you message them in bunches), an Online Mode (automatically updates your location every time you launch the app), an inclusion list (so not everyone will know you're at Hotel Utah again), and an instant MeMap info-clearing Panic Button, which Jodie Foster kind of insisted on including. There's also a monthly swagger ranking that keeps track of the most social users and hottest spots, plus plans to release an Android version in the coming months, guaranteeing you'll be able to use the app on Whatever (Phone) You Like.